Bright white light wherever you need it, even if you don’t have electricity or an outlet! Meet the bright, long-lasting light that you can stick practically anywhere! These compact, yet powerful LED self-stick lights install in seconds, using the mounting tape on the back of each unit. Click On’s fit in your pocket, and can stick to fabric, leather, plastic, and glass. Use them in your car, home, where you play, or work! 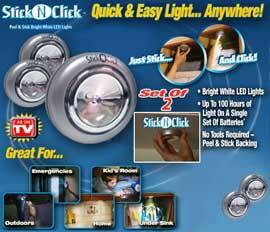 Easy to use, just press the center of the light to switch on and off.